Thanks to Justin Davis, Staff Writer for Criminal Justice Degree Schools for submitting this guest article with great tips for you when you look for your next paralegal job. The Paralegal Mentor was honored to be named to the Top 25 Paralegal Blogs by Criminal Justice Degree Schools. To see the full list, just follow this link. Whether you are a new graduate or just looking for a change, finding your next paralegal job is more difficult today in the current economic environment where employers are still cautious about adding new staff. The following 10 ideas can help you acquire the ideal paralegal position. 1) Follow the press releases: firms that are handling class action lawsuits or personal injury cases based on recalls often announce them. If you see news about a class action that has thousands of potential defendants, call the office and offer your services on a short-term basis. Your performance could make it a long-term position. 2) Call up the career services department at the school where you got your degree or certificate. Rather than asking for help in job placement, ask for the three to five firms that have most recently worked with the school to find applicants. You're more likely to find work with firms that are actively looking for help. 3) Make friends with the court clerks. Since these local, state and federal employees deal with lawyers and lawsuits each day, they often have a better sense of how firms are doing than almost any other source. 4) Watch an hour of evening television, or call your local cable company. Finding attorneys who have the money to advertise on television can open up doorways and ease the process for cold-calling - a difficult task for many. 5) Move outside the standard paralegal job description. After all, you can provide assistance in nearly any legal aspect outside of presenting a case or giving legal advice. So, expand your search to jobs that can include legal expertise. This can include working in insurance or human resources departments at medium and large corporations, or similar positions. Change your search to include keywords based on your skill set, rather than just "paralegal". 6) Contact legal professionals and buy them lunch. Reach out to people that currently have a position that you would like to someday reach and invite them to lunch so you can learn how they got to their current position. Often they will share useful advice and do what they can to help you succeed. 7) Set up Google News alerts for "Smallville law firm" and "Smallville paralegal job" or related terms so that you can receive email notifications when an online article or job posting with specific keywords is published. This could provide you with the latest information about who is hiring before anyone else. 8) Start a paralegal blog. 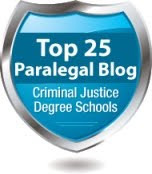 There are numerous blogs written by paralegals that attract a strong following (see the Top 25 Paralegal Blogs http://criminaljusticedegreeschools.com/top-paralegal-blogs/). Blogging can help you get found in search engines and also shows potential employers how you think and demonstrates your writing skills. 9) Attend networking events. Keep your eye out for events put on by local law firms or legal organizations. Meeting people at events can help you develop relationships with legal professionals who can help you find a job or tell you about positions that haven't been advertised yet. 10) Seek out pro-bono work opportunities. Volunteer legal work can help you meet attorneys who may be hiring or know someone who is hiring. Do a great job and legal professionals that you work with might recommend you to someone they know. Justin Davis is a staff writer at Criminal Justice Degree Schools, a resource site providing information on paralegal degrees and schools.